Transcending genre: Ask two people to classify Disclosure's music and you're likely to receive two very different answers. Pop, house, dance, garage — all of which would be accurate, but, hey, the Lawrence brothers aren't sweating the terminology. "Whatever people want to call us is fine, as long as it's positive and not insulting," says Howard Lawrence, 19. "We just write pop songs in the style of house and garage music." 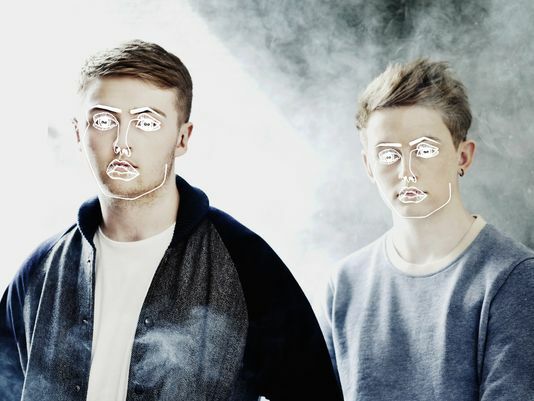 Howard and his brother Guy, 22, have been creating music together as Disclosure for only three years now, but have already established themselves as a duo to be reckoned with. Their debut album Settle, which received strong reviews in Rolling Stone, Spin andPitchfork, bowed at No. 1 on the U.K. music charts earlier this month and cracked Billboard's album chart at No. 38. Their new music video F for You has racked up more than 600,000 views in five days, while When A Fire Starts to Burn has nearly 1.1 million after four weeks. Having introduced themselves to American audiences while closing out Coachella music festival this past April, the British brothers will take their show to Lollapalooza and Hard Summer L.A. in August. All in the family: The Lawrences come from a musical background — their mother did radio jingles; their father was in a band — but the brothers were never very close growing up in Surrey, England. Guy was a drummer in an indie group who played sports and listened to a lot of hip-hop, while Howard was a more soft-spoken type who played a variety of instruments and listened to schmaltzy singer/songwriters. When Guy began frequenting clubs at 17, he became acquainted with the music of electronic producers such as Joy Orbison, James Blake and Burial, and subsequently got Howard hooked on them as well. "We both agreed they were amazing and we kind of wanted to learn how to do something like that," Guy says. "That's why we started Disclosure, to learn how to make music that hopefully someone might play on (underground music show) Boiler Room." So with a pile of their favorite records and no prior experience, the then-15- and 18-year-old brothers set out on their project. Putting a face to the name: In 2010, the guys decided to post their first two tracks,Street Light Chronicle and Offline Dexterity, to MySpace — but first, they needed to come up with a user name for the site. "Guy was filling out some car-insurance information at the same time and it just said like 'terms of disclosure' on it," Howard says. "So we were like, 'OK, that'll do.'" A similar easygoing approach was brought to the group's now instantly recognizable logo: a simple face sketch that they used as art for their first single and continued utilizing when money got tight. "Guy ended up pasting it on pictures that he liked, like James Bond and cool famous people, or just, like, fit girls," Howard says of the design. "It became this thing where people would see the face and they wouldn't even read the word 'Disclosure,' they'd just know what it meant." Can't stop, won't stop: Disclosure still has close to 60 live dates scheduled for this year and played a set Friday at U.K.'s Glastonbury music fest. They'll be embarking on a North American tour this fall, but not before headlining a sold-out Central Park SummerStage concert Aug. 6. "We don't have any free time," Howard says. "The next time we have a break is at Christmas. Then we'll probably be looking to start working again." Both have girlfriends who are none too thrilled about their nonstop travel, but will likely be stopping by for a few shows along the way, Guy reassures. Playing stateside, the brothers hope to further explore cities such as New York and Detroit — home of Guy's musical idol, the late hip-hop producer J Dilla — as well as finally give Kanye West's new Yeezus album the "proper listen" it deserves, as Guy puts it. Asked about their favorite American dish they've tried, the answer is unanimous: an In-N-Out burger, animal-style. A little help from their friends: The duo is currently collaborating with rapper Azealia Banks in the studio whenever they can catch a breather, and have hip-hop stars Kendrick Lamar and A$AP Rocky on their wish list. Even more exciting, though, are the U.K.artists featured on the duo's debut album, such as Jessie Ware, AlunaGeorge and Sam Smith — all of whom are also on the rise in the USA. "It feels kind of like a team and we're all just doing our thing," Guy says, remarking on how all of their collaborators have found success with "proper music and good songs" and not "sell-out chart music." And how does Howard feel about he and his brother's own wild success? "It's been really great," he says. "We only started doing it for fun and because we love it, and we'd still be doing it if we hadn't gotten anywhere." One thing's for sure: The ever-humble Lawrence brothers are definitely somewhere now.